How to make a successful business out of a technical idea or product? Making a successful business is not easy. Making a successful business out of a technique or technical product might be even more challenging. 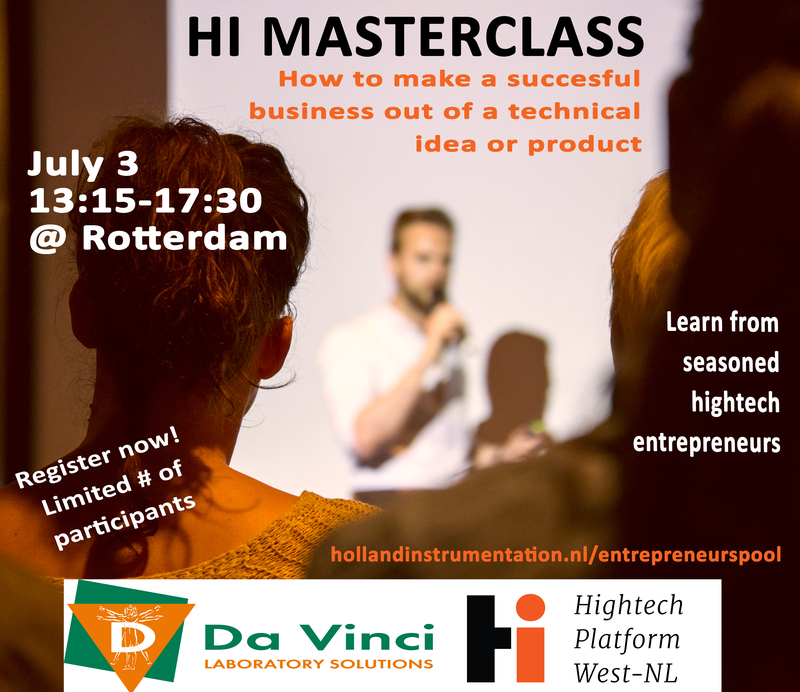 During this HI Masterclass on July 3th in Rotterdam you will learn how to commercialize a technique or technical product. By discussing realistic business ideas we will help you get a births eye view on all relevant topics for a promising – one page – business plan. Learn how to address all relevant topics ranging from revenue streams, the added value to your potential customer, costs, your market, the organization as well as suppliers. Make use of the experience successful entrepreneurs will share during this HI Masterclass. Meet Iwan de Waard (ImProvia) and Bart van Mierlo (Science and Technology Corporation). “During this practical master class I learned again that ambition is key for putting a successful high tech product on the market”. For this masterclass we invite entrepreneurs (to be), employees or students who wish to develop their entrepreneurial skills or are thinking about starting a business. Entrepreneurs with plans for company growth are also welcome to participate. Join this HI Masterclass by sending an email with your name, your affiliation and your business idea (if any) to pool coordinator Karin Huiberts (k.huiberts@hollandinstrumentation.nl). This HI masterclass is free of charge. Since the number of participants is limited, registration will be on ‘first come first served basis’. Don’t hesitate to call Karin with your additional questions about the program: + 31 6 46 122 489. The organisation of this event is made possible by a contribution of the province of Zuid-Holland.